Plenary speakers: Nanako Shigesada, Carson C. Chow, Iain D. Couzin, Steve A. Frank, Hawoong Jeong, Laura Miller, Akiko Satake, Tatsuo Shibata, Yanni Xiao See program book for detail. Minisymposia proposal is closed on February 28th, 2014. There has been 71 minisymposia proposals. See program book for the list of accepted minisymposia and the invited talks therein. The submission of contributed talks and posters is closed on May 31. See program book for the list of accepted presentations. Please make registration, hotel booking, payment, and abstract submission from online registration page: REGISTRATION/ACCOMMODATION/ABSTRACT SUBMISSION PAGE (in Janan Travel Bureau's site). As we knew that quite a number of people were unable to make payment from JTB West's online registration page, we decided to postpone the deadline for early bird registration and abstract submission for contributed talks to May 31. In case you are unable to get your payment processed online, JTB Western Japan Coop. will provide the way to process your payment manually, the detailed instruction to which will be posted on the online registration page. 1) Please ask all the speakers of your minisymposium to register and make payment for the conference fee from the registration page described below. The conference fee for the members is applied to an invited speaker, even if he/she is not a member. Please make sure that all the speakers have finished registration and payment. Send us the Inquiry Numbers of their registration when you send me the abstracts of their talks (see below). 2) Please collect all the abstracts of the invited talks of your minisymposium, and send them to me (to the address: sasaki_akira(at)soken.ac.jp; cc to: jsmb-smb2014-prog(at)cp.cmc.osaka-u.ac.jp; use the subject: JSMB/SMB Minisymposium Abstracts) by May 31, 2014. Abstract must be submitted as PDF and must not exceed one A4 page (for each talk). Follow descriptive flyer for contributed talks for further detail of the format. Abstract template files can be downloaded from here. We would greatly appreciate your kind cooperation. We are please to inform you that the site for the registration, hotel booking, payment, and abstract submission is now open. Please register from REGISTRATION/ACCOMMODATION/ABSTRACT SUBMISSION PAGE (in Janan Travel Bureau's site). Those who would like to give contributed oral talks and poster, please also visit this site, register and submit your abstract (see below). Contributed talks and posters is now open for registration. The abstracts for oral presentations and posters must be received by May 15 31, 2014. March 24, 2014: Accepted minisymposia are listed below. Now you find all the titles of 70 accepted minisymposia and their organizers in the middle of this page in Minisymposia section. February 28, 2014: Minisymposium proposals submission is closed. July and August are high season for flights to and from Japan. We therefore strongly recommend you to book air tickets as early as possible. See here for more information. 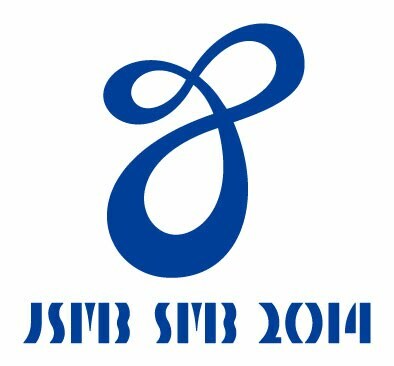 The deadline for minisymposium proposal for the Joint Annual Meeting of the JSMB and the SMB, Osaka 2014 has been extended until February 28. We welcome proposals from all areas of the life and medical sciences at the interface of mathematics and its application to biology. Toshiyuki Namba, The Chair of JSMB/SMB 2014 Organizing committee.